I've been looking to leave a record of my projects. AKA something I can look back on and see all the progress I've made. This will be a dumping ground for progress on my discord bot. Possibly other game stuff, depending on what I hop around to. We shall see. Previously, I have hopped around Unity projects, trying to make a platformer, among other things. I've never really settled on something small enough, to make something complete. At the moment, I work on my discord bot: Bombos. My goals for Bombos bot are to make a small series of minigames. 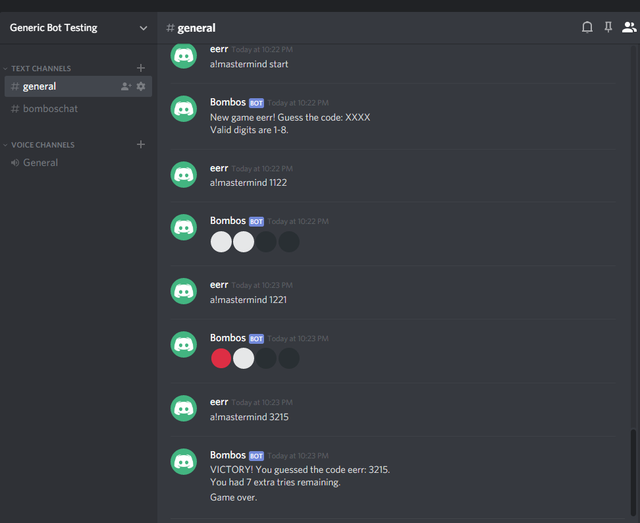 Discord bots, through discord, allow easy access to text input, online. These messages are sent through a discord server. Essentially, I have unprecedented easy connectivity to players, and the ability to ship builds of my game with the greatest of ease. No server setup for me, just a few text tokens, a discord account, and the tutorial mentioned above. About Bombos: He is a new bot, started in 2018. My favorite media inspiration draws from several science-fiction sources. Should I ever reach a certain point, where I am working on that sci-fi space travel game, maybe Bombos will be the designated AI. The name is a nod to the Bombos medallion from A Link to the Past. It makes explosions all around you. My basic idea was for Bombos to explode if the player failed to beat (Say, Mastermind) in time, or in the correct number of guesses. Is it insensitive to name a robot after Bombs? I don't know. I am working on, a!mastermind the command. Currently I've advanced beyond Bombos' minimum viable product. AKA if I actually left the bot up for any amount of time, you could play mastermind with it. I cheated to make that fit, since the bot eats a ton of space right now. I might consider running the bot more permanently if there is any demand. Mastermind, is a game about signaling. The goal is to guess the answer at the other end, based on limited information. At the moment, my work on the bot is a bit stalled. I want to implement fancier features such as implementation. The tutorial touches upon a database. AKA I migrated an SQL Lite database. But I know next to nothing about databases. So far, the 'migration' involved writing a small amount of csharp code, inheriting from a specific class. The migration then auto-magically changes the code, and established a couple of other files. As far as I can tell, these are files for working with the database. The migrate function is mysterious.